Discontent and its Civilizations: Dispatches from Lahore, New York, and London, by Mohsin Hamid (February 24th, Riverhead): In case the inverted title weren't enough to sell me on this one, the promise of "intimate and sharply observed commentary on life, art, politics, and 'the war on terror'" certainly is. Find Me, by Laura Van Den Berg (February 17th, FSG): Van Den Berg's debut novel draws on her skills and experience as a short story writer as she dives into a world wracked by a disease that takes peoples' memories and the impact this strange world has on one particular woman, Joy. My Sunshine Away, by M.O. Walsh (February 10th, Putnam): This one's already been getting a ton of coverage as a great new book club pick, which I'm hoping means there's lots to pick apart in this story of an unimaginable crime in a small Baton Rouge neighborhood. She Weeps Each Time You're Born, by Quan Barry (February 10th, Pantheon): Shannon at River City Reading mentioned this one in a post of hers a while back, and I'm intrigued by the modern Vietnam history angle--a subject I know nothing about. After Birth, by Elisa Albert (February 17th, HMH): Albert's debut novel is said to explore the ever-complicated themes of childbirth and new motherhood, which, twist my arm, sounds right up my alley. What do you have on your radar for this month? So many great books. I have so many I want to read! It's worth it to listen to one of his audiobooks (one of the ones he narrates) if you like audiobooks--once his voice got in my head, I heard him reading all these short stories to me, which I think made them all the better. Hope you like it if you get time to pick it up! 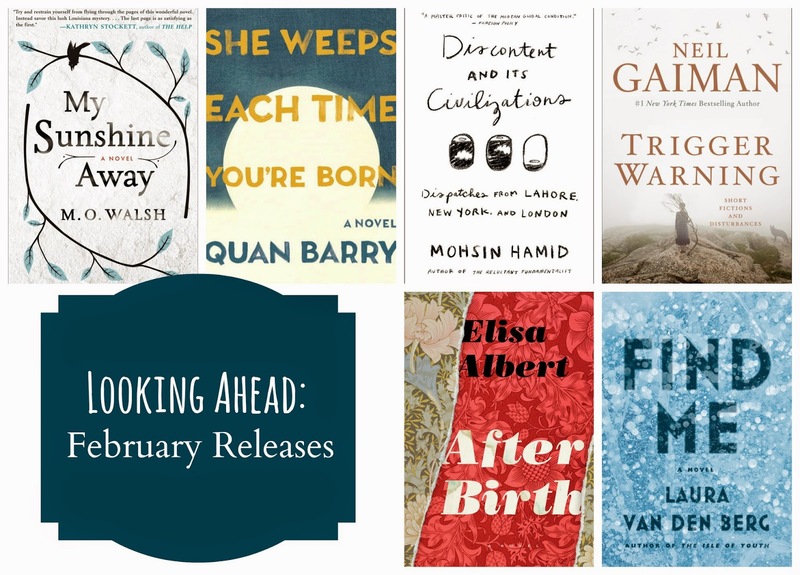 Did February conspire against us to make our TBR piles larger in the shortest month of the year? My Sunshine Away sounds great! Oh Gaiman, how I adore your work. I've been eagerly anticipating this one. I know I've already read a few pieces in the collection, but I'm glad to read your review and hear of a few new-to-me pieces. You nailed it when you talked about his unique writing style. There's just something about him. I've been hearing such great things about My Sunshine Away. I can't wait to read it! Guhh I really need to read Gaiman. This sounds incredible, like everything he writes does. I didn't know Mohsin Hamid has a new book out. I'm so excited. And everything else that's coming out in February looks great too. What a month. I'm close to finishing--it is great! It's a great story, if a little intentionally meandering. I'm loving Walsh's descriptions of Louisiana and Baton Rouge in particular. I haven't read anything of his but this one looks fascinating to me.